The first official state visit of Trump's presidency has been full of pomp and pageantry and gestures of affection between the two leaders. 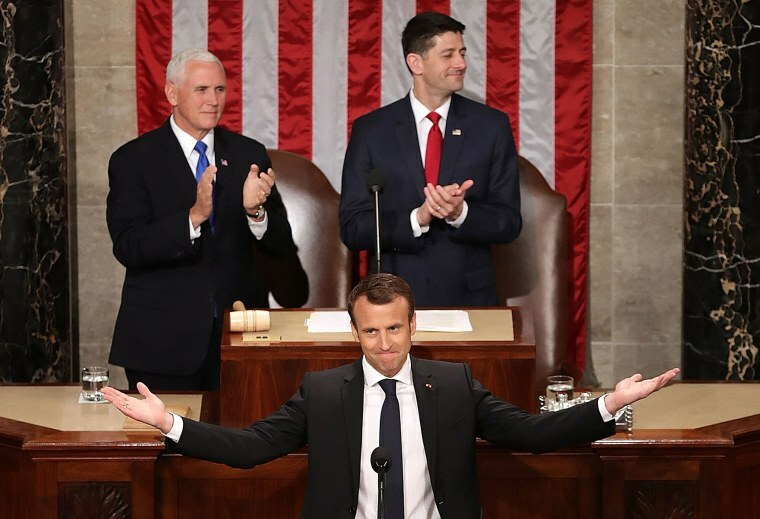 French President Emmanuel Macron is welcomed with a standing ovation Wednesday during a joint meeting of the U.S. Congress as Vice President Mike Pence and Speaker of the House Paul Ryan look on. 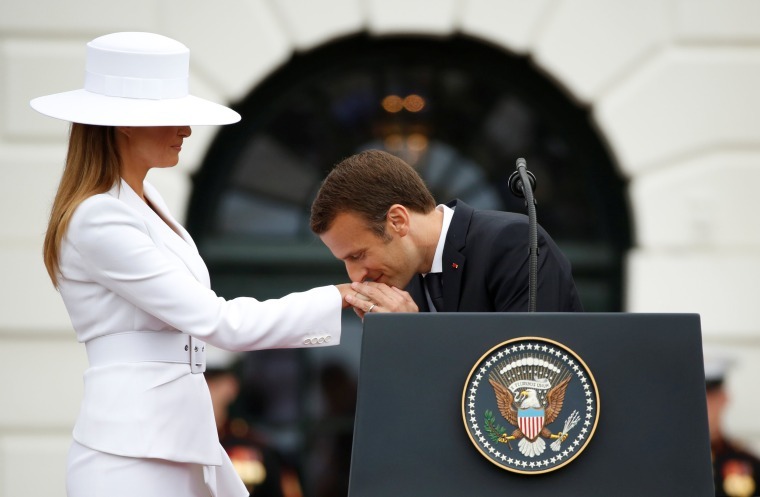 Macron drew on the shared history and "special bond" of U.S.-French relations, telling Congres, "the American and French people have had a rendezvous with freedom." 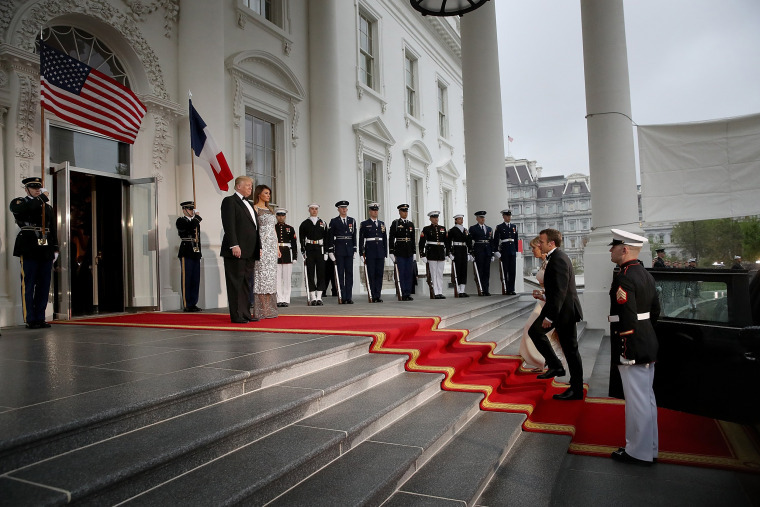 President Donald Trump and first lady Melania Trump welcome Macron and his wife Brigitte to the White House for a state dinner on Tuesday night. More than 130 guests dined on rack of lamb and nectarine tart and enjoyed an after-dinner performance by the Washington National Opera. 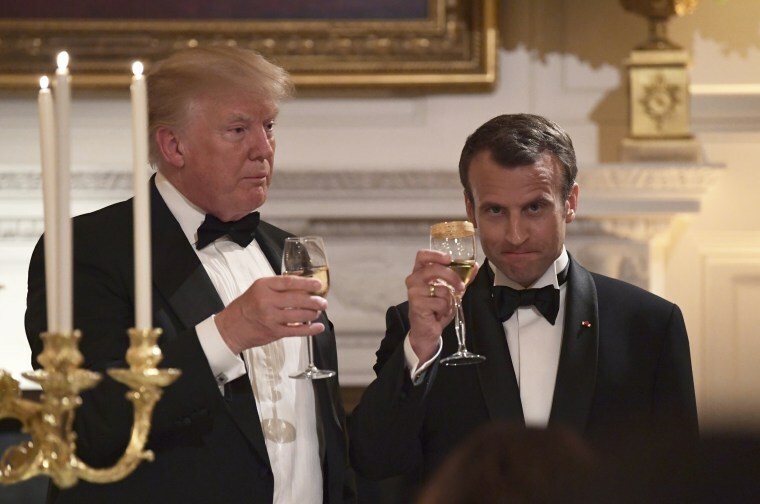 Trump and Macron raise their glasses for a toast during the state dinner. 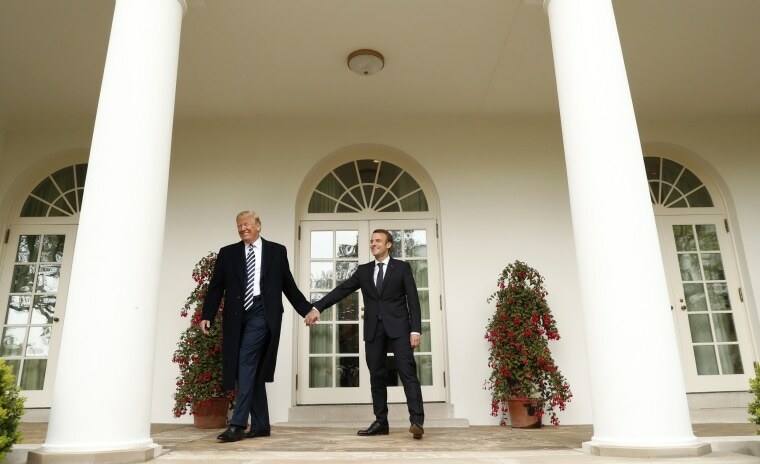 Trump and Macron leave a joint press conference at the White House on Tuesday. 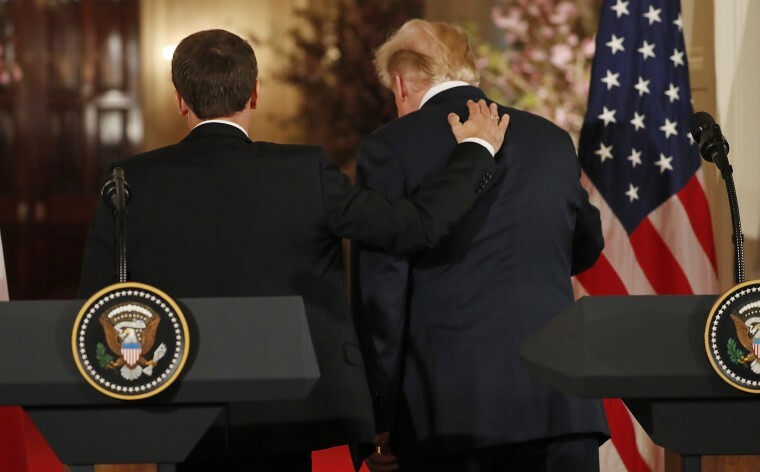 Trump and Macron professed a sunny, chummy relationship, even as the two allies strained to bridge differences over the Iran nuclear agreement, Syria and more. 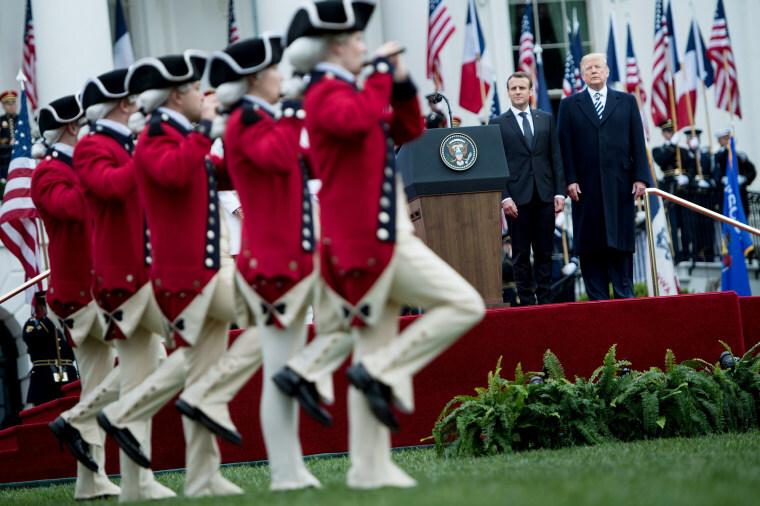 Trump and Macron walk down the colonnade at the White House following the official arrival ceremony for Macron on Tuesday. Trump ended his first year in office without receiving a foreign leader on a state visit, the first president in nearly 100 years to fail to do so. 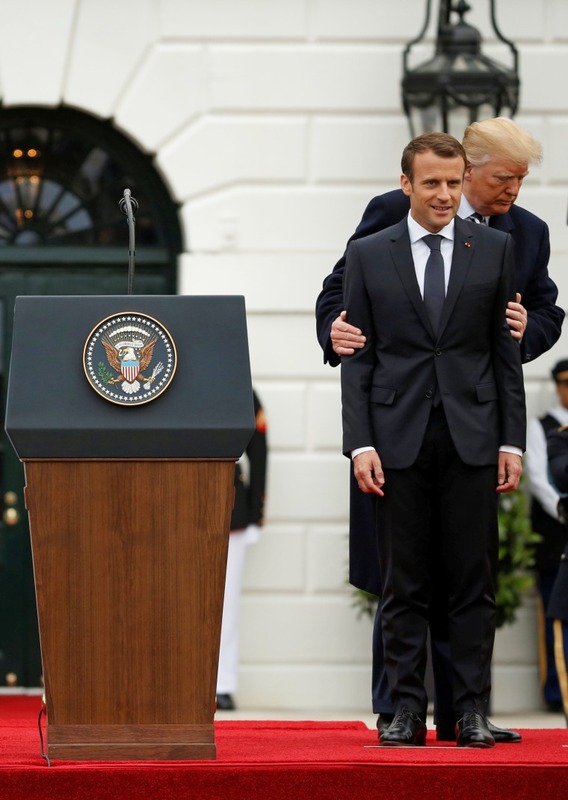 Trump and Macron attend an arrival ceremony at the White House. The two leaders' meetings follow the collaboration by the U.S., France and Britain in missile strikes in Syria earlier this month to respond to a suspected chemical weapons attack. 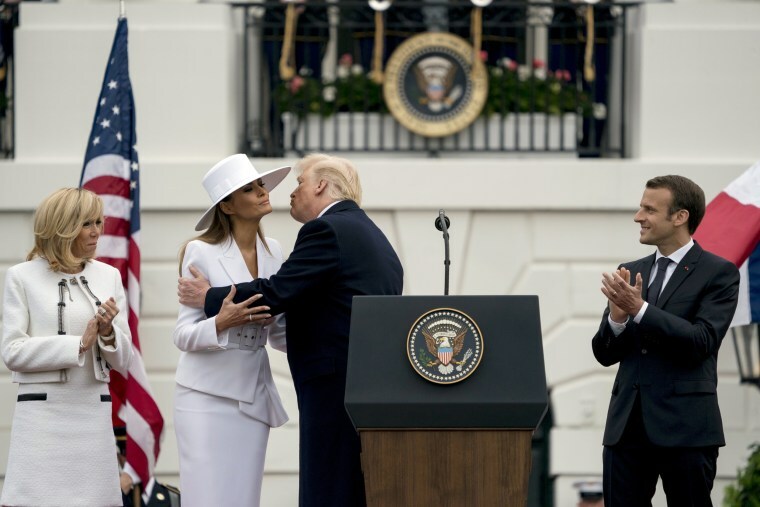 Trump kisses first lady Melania Trump during the arrival ceremony on the South Lawn of the White House. Troops parade during the arrival ceremony. 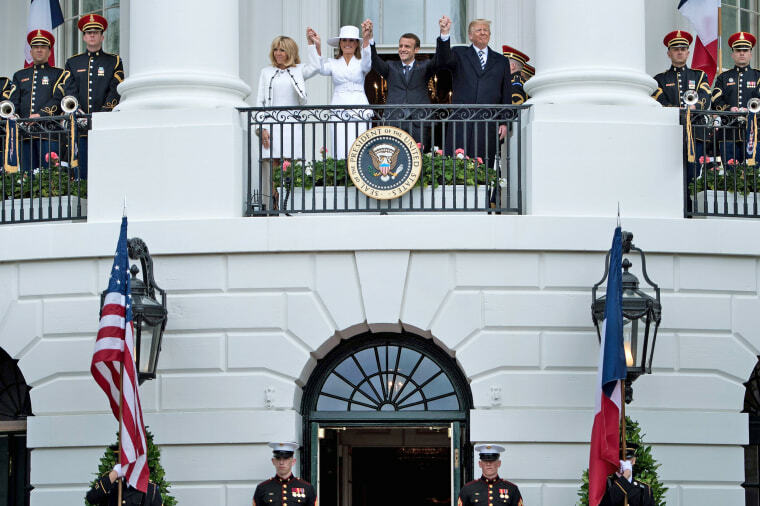 From left, Brigitte Macron, Melania Trump, President Macron and President Trump stand on the Truman Balcony of the White House. 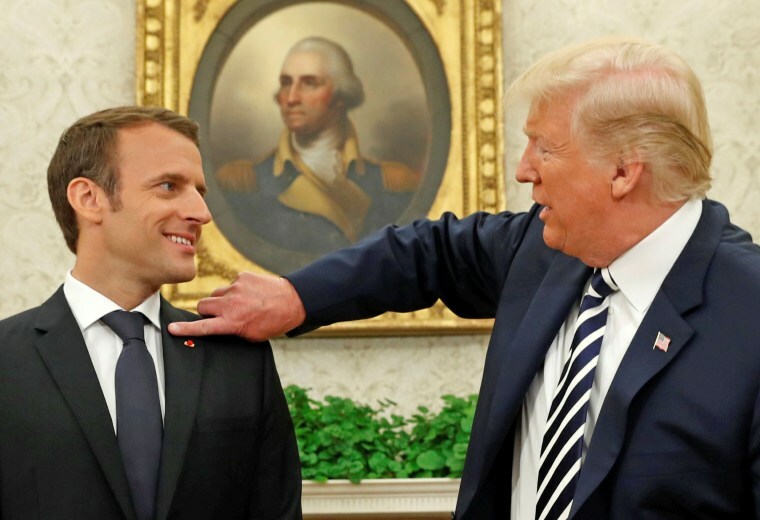 Trump flicks something off Macron's jacket during their meeting in the Oval Office on Tuesday. "We have a very special relationship, in fact I'll get that little piece of dandruff off," Trump said. "We have to make him perfect — he is perfect." 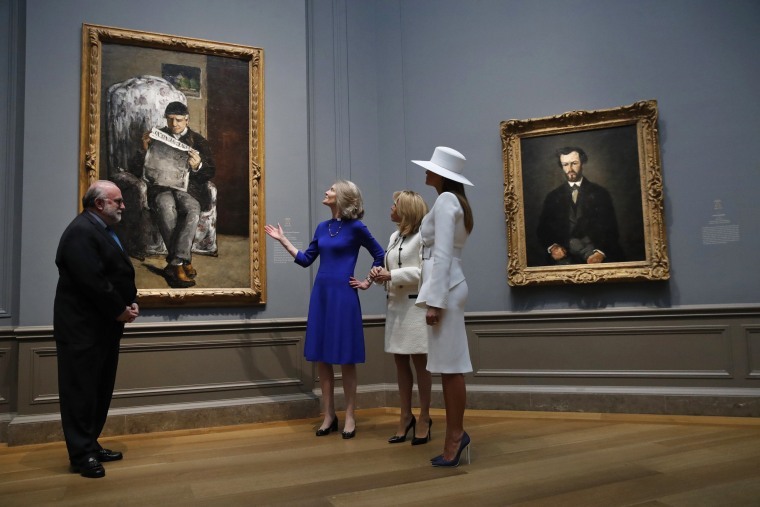 Melania Trump and Brigitte Macron tour the National Gallery of Art on Tuesday. Spectators watch as Marine One carrying the Trumps and the Macrons takes off from the South Lawn of the White House on Monday. 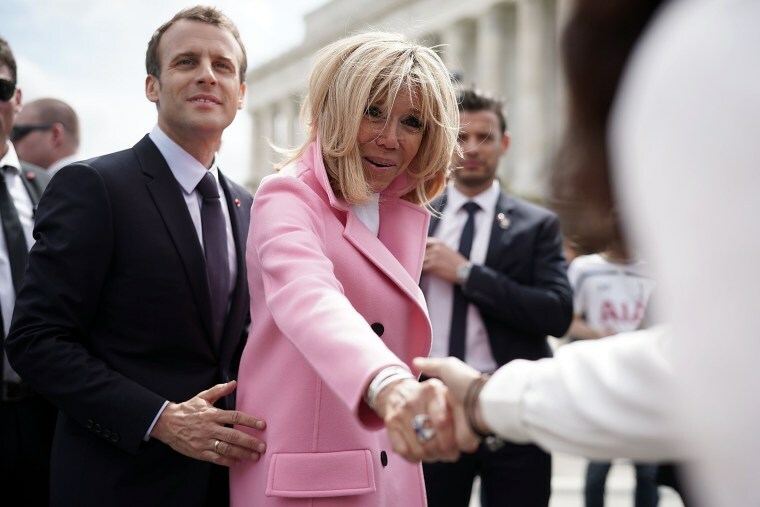 Brigitte Macron greets members of the public at the Lincoln Memorial on Monday. 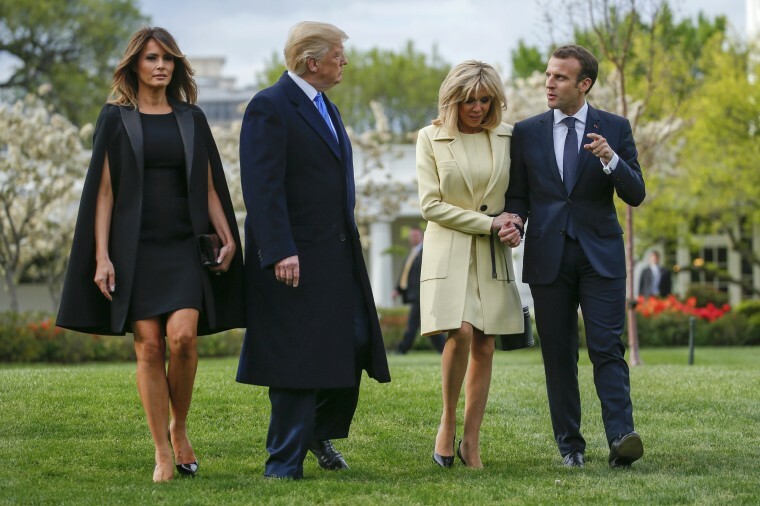 The Trumps and the Macrons walk to a tree-planting ceremony on the South Lawn of the White House on Monday. 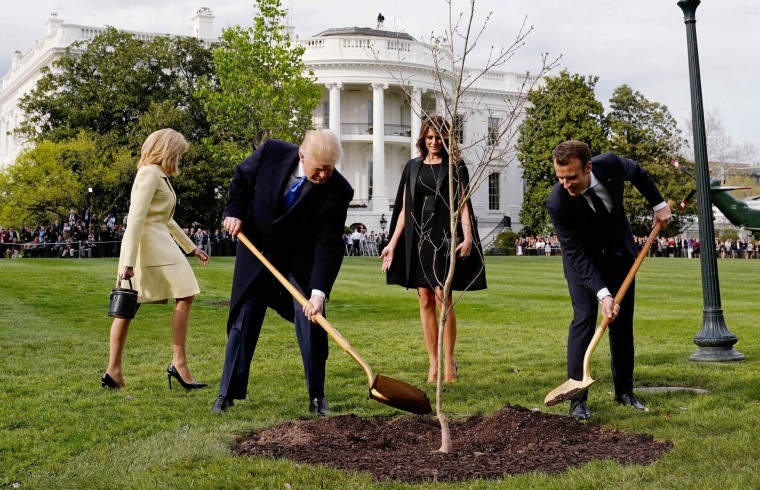 Trump and Macron shovel dirt onto a freshly planted oak tree. 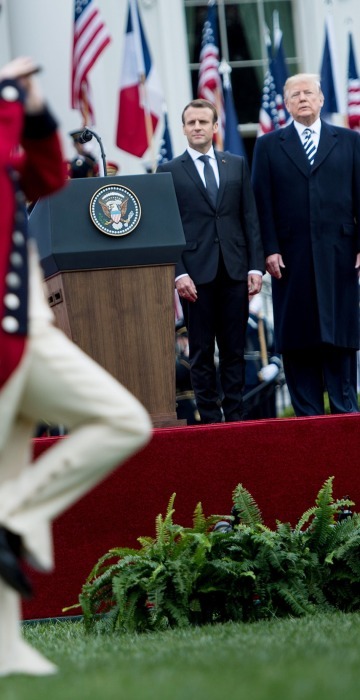 Macron presented an oak sapling taken from the site of the key World War I battle at Belleau Wood — a legendary spot for the U.S. Marine Corps. 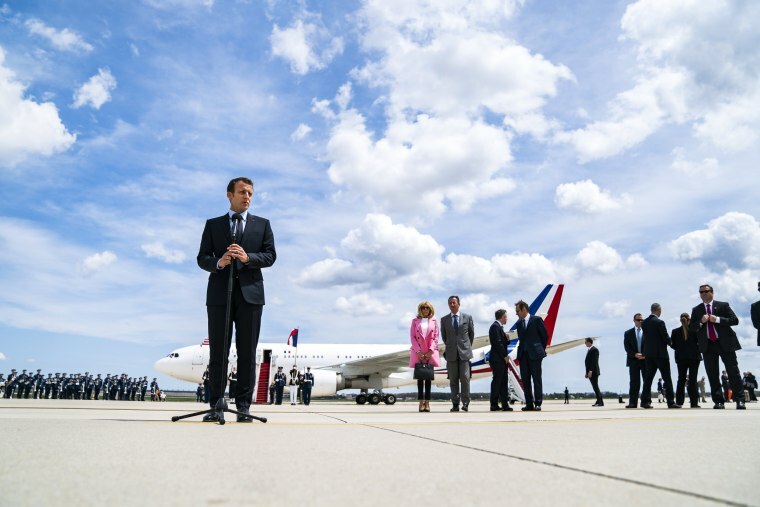 Macron speaks to the media after arriving at Andrews Air Force Base on Monday.